Restaurant Reservations version 1.3 is now available on the WordPress.org repository. This version lets you add and edit bookings from the admin area, adjusts the default bookings view and includes a bunch of new features and fixes. Read on to learn more. The big feature that went into this version is the ability to add and edit bookings from the admin area. A ton of work went into building a quick, painless workflow for adding, editing, confirming and rejecting bookings. 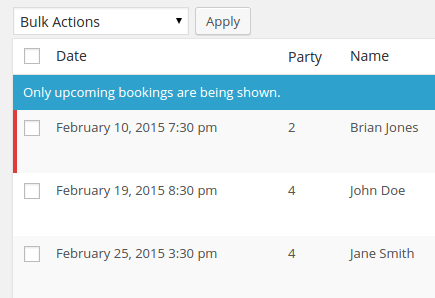 Here’s a quick look at how you add a booking from the bookings panel. By default, adding or editing a booking in the backend won’t send out an email notification to the user. Most of the time, you’ll be putting in bookings received by phone, or editing a detail that doesn’t require a new email be sent out. But you can tick a box in the form to send the usual notifications when a booking is confirmed or rejected. When Restaurant Reservations was built, it was designed to be a companion to your existing bookings management system. But it’s clear from talking to people using it (almost 10,000 downloads!) that a lot of you wanted better tools to manage the bookings from your WordPress site. So I put some energy into improving the bookings panel for this release. In addition to adding and editing bookings directly, I also changed the default view. When you load up the bookings panel, you’ll only be shown upcoming bookings — the ones you need to deal with most urgently. You can still switch between views of today’s bookings, upcoming bookings and all bookings. Now, when you do, you’ll get a clear notification so you know what you’re looking at. The date and time pickers on the booking form have exhibited problems on iOS 8 devices (Apple’s iPhones and iPads). The library which generates these pickers has received several updates to try to address these issues. But each time a solution appeared in site, another nasty little bug would rear its head. I’m happy to say that just yesterday I managed to resolve the last critical bug, and the rest of the issues have been dealt with to ensure wide device and browser compatibility. I know a lot of you have been waiting for this fix and I’m delighted I can finally bring it to you. scolast34 contributed a complete German translation, and partial Dutch and Chilean translations are also included. Major steps were taken to improve compatibility with WPML, the leading multi-language plugin for WordPress. The plugin should be almost fully compatible, but in some unusual instances a couple strings are still not getting translated properly. We’re working on ironing out the last issues. Under the hood, some changes have been made to the textdomain which links translations to the plugin. If you’ve already made a translation, the plugin should pick that up and use it without any trouble. But in the future WordPress.org is going to support downloading translations directly, and these changes get the plugin ready for that. Developers rejoice: filters for everyone! Thanks to Primoz Cigler, the $fields array which is used to construct the booking form now accepts custom classes for every fieldset, legend and field. If you want to take advantage of that, read the inline documentation. I’ve also added a bunch of new filters to the email notifications class, so now it’s easier than ever to register a custom notification. A lot of work went into this release and I’m really proud of how the add and edit bookings workflow came out. Take another look, this time at how the bookings are edited. Lately, I’ve made a lot of progress on an addon which will make it easy for you to add custom fields and edit your booking form. Look out for this in the next month or two, or sign up for my mailing list if you want to know when it’s released.